All trips are weather and tide dependant and launch times may vary accordingly from those stated. Your launch time will be confirmed the day before. 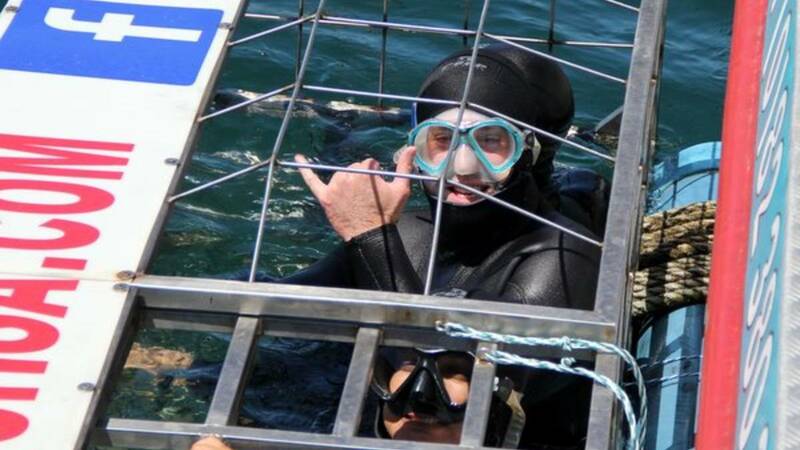 Unlike bungee jumping or sky diving, the adrenaline rush from shark cage diving comes from being face to face with one of the world’s greatest predators: the Great White Shark. The experience puts you in their territory while the safety of the activity allows you to be an observer and learn what Great White Sharks are really like. An on board marine biologist will educate you about this amazing apex predator. 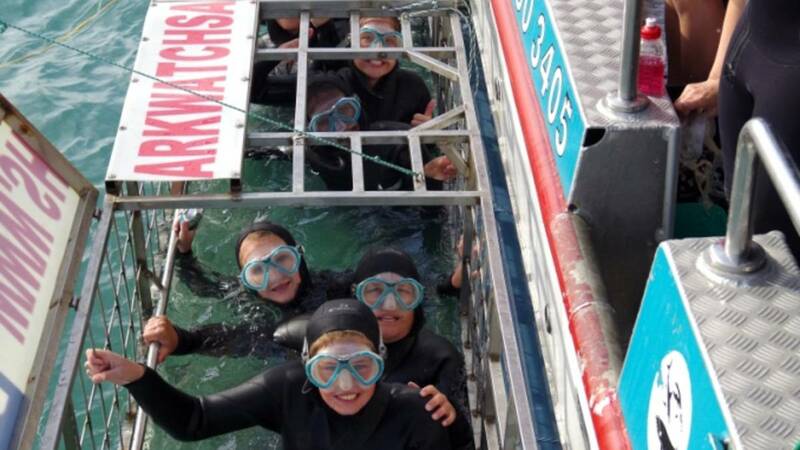 Shark Cage Diving is safe for children and elders and gives the whole family a wonderful opportunity to bond in a fun environment surrounded by experts and researchers. After this once in a life time experience, you’ll find yourself buzzing with excitement and adrenaline. You will have had the opportunity to come up close and personal with one of the oceans most majestic and foreboding creatures. •	Lastly, a debrief in the Great White House and a celebratory beverage to toast the occasion! 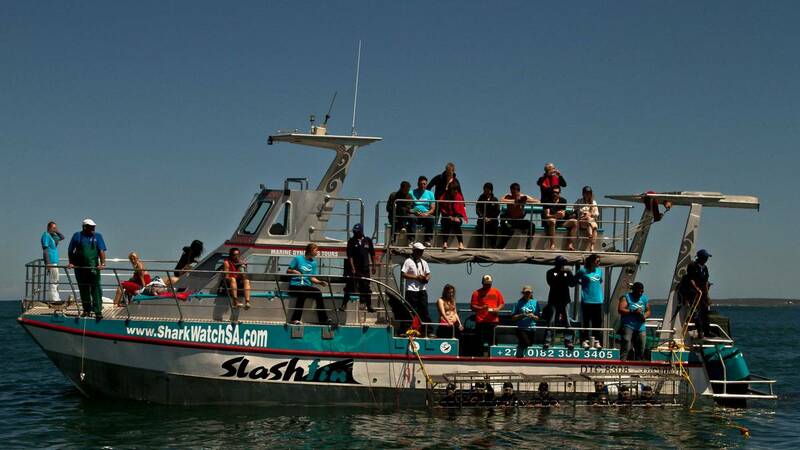 •	Our Boat (Slashfin) is the largest in the industry (most deck space per customer) and was purposely built for shark cage diving and includes two restrooms, and an upper deck for the ultimate viewing and photography experience when not in the cage. 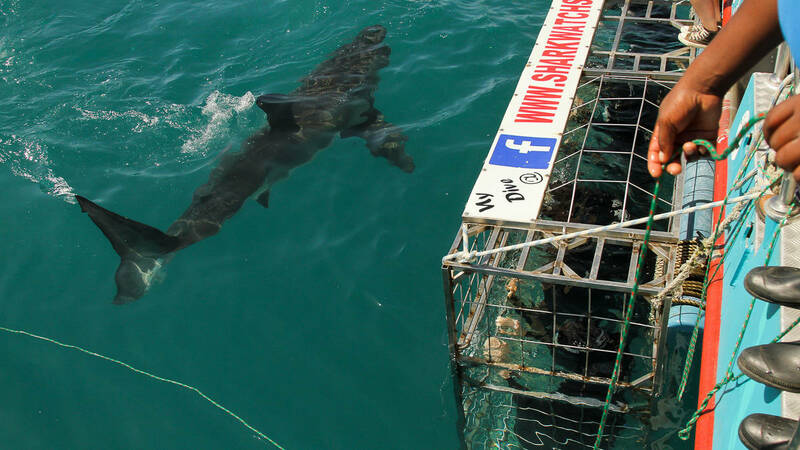 •	Our crew receives as many compliments as the Great White Sharks, with more combined experience than any other Shark Cage Diving crew. •	You will leave with great memories and a deep appreciation of this majestic animal. When7 days a week year round, subject to availability and weather conditions. Only closed on Christmas day and New Year. Time slots are not confirmed times. Please ensure that you make the whole day available as we can only confirm times the day before, and is not negotiable. WeatherThe service is weather dependent. Contact must be made 24 hours before the time of the excursion to be informed about the local weather and sea conditions. What to WearBathing Costume, warm clothing (it is cold on the water when the wind blows), tackies / sneakers, wind breaker. Things to BringCamera, Sunblock, Sunglasses, Bathing Costume, Anti Nausea medication (should seasickness be a concern- recommend that it is taken the night before and two hours prior to the trip). Guests or SpectatorsGuests can wait for their party at The Great White House Restaurant where they can purchase drinks, meals and shop for curios. InclusionsChauffeur driven ONE WAY transfer to OR from Cape Town, A Shark Cage Dive / Viewing guided by a marine biologist, Road Transfer from selected locations, a light meal (breakfast or lunch depending on time of trip), refreshments on board and soup and bread on return is included. Equipment such as wet suits, booties, masks, towel are provided. Life jackets and waterproof jacket is alo supplied. ExclusionsA video link of your experience is not included in the price but can be purchased in addition to the dive / viewing excursion. Cost R200. This is uploaded 24-48 hours after trip and once downloaded can be used across social platforms and saved for your memories.